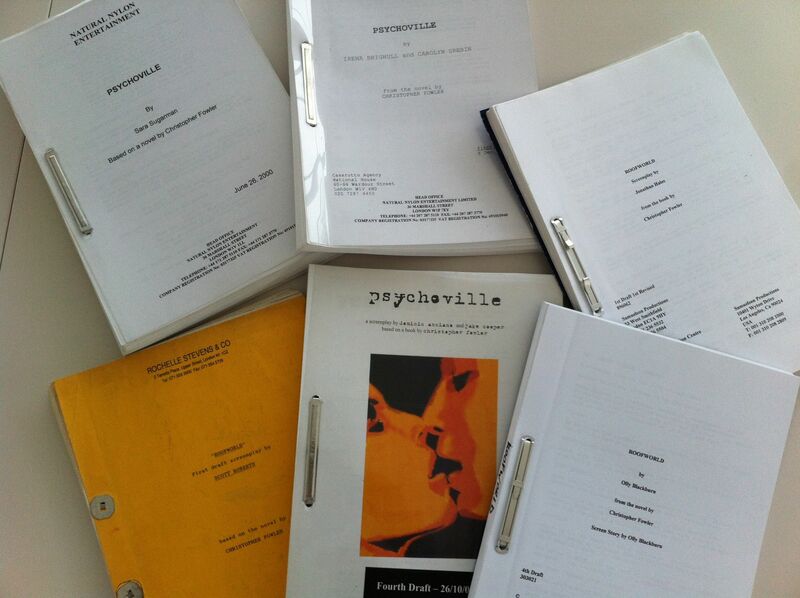 Here are just a few of the scripts that have been written from my books. I found them in a drawer when I was clearing stuff out recently. All of them are by writers commissioned by film companies. None got made. After thirty years of hammering out my own scripts that never got made, I made a promise this year – to never write another screenplay again. I have half a dozen of the buggers in boxes, and wasted years redrafting them over and over for different clueless producers who didn’t know what they wanted. There are several other reasons for stopping. First, there are many different types of writer, and the sector in which you become successful becomes your straitjacket. I don’t personally know any novelists who became screenplay writers, or vice versa. Second, the chances of making a film in the UK are slim to none if you are not already established in TV or film as a writer. Third, for some mysterious reason the holy grail of scriptwriters is to make a blockbuster, and there’s now a way of making those that does not involve sending a script to a film company. Let’s go through those in a bit more detail. 1. Where you start is where you stay. The area that draws you initially is a good indicator of where your interests lie. I never watched much TV as a kid and still hardly ever turn it on. I always read. Novels do teach you to write in a certain way, and switching to TV is hard. Lately, TV scriptwriters have been writing crime novels, and their books usually read like episodes of cop shows. Lynda La Plant’s books all feel like TV shows, as if they’re in the wrong medium. The books I’ve had optioned get turned into rubbish scripts by hired writers – nobody hires the novelist. A few years ago I wrote a script called ‘Breathe’, which I turned into a book. Pathe Pictures bought the book and commissioned their own script without ever looking at my original. The result was disastrous, and was never made. ‘Hell Train’ started life as a script, and when we couldn’t sell it I rewrote it as a book – no wonder people say it’s cinematic – that was the original intention! 2. The UK film industry barely exists as a single entity. The French subsidise their filmmakers partly through venture capitalism to the tune of about €1.6 billion a year; we got rid of the film council just as it started to make money with mainstream films, and an ill-informed David Cameron made an astoundingly mistimed speech about the need to make blockbusters. 3. Don’t write a script, make a movie first. A new trend has emerged among young filmmakers. Both Gareth Evans and Gareth Edwards showed what they could do by making test shorts of their debut features – and both features (‘The Raid’ and ‘Monsters’) are brilliant. Stephen St Leger and James Mather made the short film ‘Prey Alone’ to show what they could do, and have now made the SF biggie ‘Lockout’. The reason why this is possible is the rise of cheap CGI, although all three recognise the importance of story. In particular, Gareth Edwards’ interviews about how he made a blockbuster in his bedroom are hilarious and charmingly self-effacing. If I was a Hollywood director, I’d be very worried about this development and its rising success in Europe. But it does mean that the days of submitting a script for a mainstream film are nearly over, although Hollywood, always behind, will take a while to catch up. Studios never liked reading them anyway and prefer ‘look books’ of visuals. Watch the low-budget gem below and you’ll ask yourself why scripts in their old form are needed at all. The biggest exception I can think of is William Goldman, who started as a novellist and went on to write some successful screenplays (Butch Cassidy, Heat, Misery etc). The Princess Bride was a good film but also a superb novel by him. He is admittedly better known as screenwriter. The best exception I can come up with is Paul Cornell, who has written extensively for tv and novels (and more recently for comics). And has done both for others as licensed work and for himself. But yeah, I’d definitely say he’s the exception that proves the rule. And I think you’re spot on with this article, and I don’t see that as a problem either. I think the blockbuster has been slowly dying out through overexposure over the years anyway, needing ever more just to keep an audience’s attention. And the quality of independent projects is ever increasing, both because of the developing technology and people becoming more clever at using what’s within their means. I can’t quite see scripts dying out completely. You wouldn’t really want someone else to wing your $100,000 investment, entirely. The new technologies haven’t helped, all that much. They seem mainly to have brought us better shape-changers, blasts to race away from, star belts to zip through, and singing dancing rodents. Oh, and actors/actresses who mostly shoot, duck and cover, and then neck (snog is it?) between drug-seller or alien attacks. Of course, waiting for the change isn’t easy, with no guarantee, but despair not. It sounds like you might have a spot of the London grays and would benefit from another trip to a sunny clime. Oops. Naturally, I meant $100,000,000.00, not $100,000.00, which would be the total for 4 tickets with 3-D glasses (return required), large boxes of popcorn and assorted small bags of candy, for all. That was a fascinating bit of film even if more than 50% is bangs and flashes. I loved the use of levels and “everything’s a game.” The script wouldn’t be nearly as attractive to anyone lacking an imagination and I suspect that is part of the problem for writers. They can see in their heads what it would be like on screen but the readers can’t. Good points about writers not crossing over from novelist to screenwriter or vice versa. It’s easy to identify exceptions. (Michael Crichton comes to mind.) We could probably play “name the exception” for a while. I claim dibs on William Faulkner. But they’re note-worthy cases in part because they defy the rule. Folks like George R.R. Martin, who have played at both, have made comments very much like Mr. Fowler’s. (Martin gave up on Hollywood in frustration and wrote Game of Thrones to be “unfilmable.”) Anyone who wants to be a successful novelist is playing against the odds. So is anyone who wants to be a successful screenwriter. Anyone who hopes to do both, and have both work, is planning to join an elite cadre that can probably be counted on the available fingers in your house.